Luke Wright smashed an amazing century to guide Sussex to an astonishing three-wicket NatWest T20 Blast win over Gloucestershire at Bristol. With just two overs remaining, the visitors still required 43 to overtake Gloucestershire’s 185 for four. But the 19th over, bowled by James Fuller saw the game turned on its head as 34 runs were added. Wright hit four sixes off it, the last after Fuller had been ordered out of the attack for two no-balled full tosses and Craig Miles was forced to bowl the final delivery. That left only nine needed from the final over, sent down by off-spinner Jack Taylor, and two more Wright boundaries sealed a sensational victory with a ball to spare. Wright finished unbeaten on 111, having played virtually a lone hand with the bat for his side. He had cracked 7 fours and 8 sixes in facing just 56 deliveries. Earlier, Michael Klinger had taken his NatWest T20 Blast run tally for the season to 518 in just seven innings as Gloucestershire posted what looked a winning score. After a delayed start until 6pm, the Australian shared an opening stand of 88 in 10.4 overs with Hamish Marshall (37) after winning the toss. 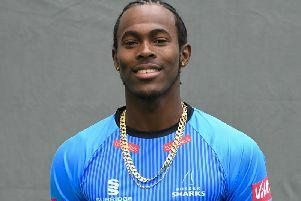 Marshall, returning after a calf injury, lost nothing in comparison with his captain, scoring his runs off 27 balls, with 4 fours and a six, before being caught at mid-on attempting to pull a ball from Tymal Mills. Ian Cockbain, also enjoying an excellent run in the competition, then joined Klinger, who reached a 41-ball half-century, with 4 fours and a six. The pair added 42 in four overs, taking unusually heavy toll on Michael Yardy, whose three overs cost 41, before Klinger skied a catch to wicketkeeper Craig Cachopa attempting a big hit off Chris Liddle. Cockbain hit three sixes in moving to 30 off 16 balls. And after he was bowled off an inside edge by Mills, Benny Howell (25 not out) and Geraint Jones (16) ensured Gloucestershire of a competitive total. The Sussex response got off to a poor start when Chris Nash, having hit the first ball of the innings for four, fell lbw to James Fuller two deliveries later. It was 13 for two when Matt Machan got a leading edge to Klinger at cover in Fuller’s next over and 51 for three when Craig Cachopa fell for 18, caught at long-off to give left-arm spinner Tom Smith his 17th wicket in South Group matches. Despite Wright’s best efforts, Sussex were only 67 for three at the halfway stage of their innings. And when George Bailey smacked a Benny Howell full toss straight to Marshall at deep mid-wicket their chance looked to have gone. When Smith struck again to have Harry Finch stumped the asking rate was already above 13 an over. Two Wright sixes saw 21 come off the 17th over from Kieran Noema-Barnett, but Taylor conceded only five off the next and Gloucestershire seemed as good as home. Wright had other ideas as a woeful over from Fuller changed the course of the match. Of his amazing match-winning innings, Luke Wright said: “I’m especially delighted being skipper this season. When I took that role on I always thought the best way I could lead was with performances like that. “Credit to Gloucestershire because they were getting their yorkers in well and making it difficult. But I changed my bat for a bit of luck, they started to miss their lengths and I finally managed to get a few out of the middle. “With ten overs left I felt we had too much to do because they were bowling so well. But in the end the kept putting the ball in my area and it was a very special night for me. Gloucestershire captain Michael Klinger said: “It was a crushing defeat for us in the circumstances, but all the credit must go to Luke Wright for a fantastic innings.